Pond in the woods… so pretty!! Part of the way round, we stopped at a local vineyard where we were given wine and a sort of bread with bacon bits in it (water and soft drinks were also available, but who over the age of 16 drinks those at a vineyard?). Later on the route, a large tent had been set up and there was food and drink for sale. 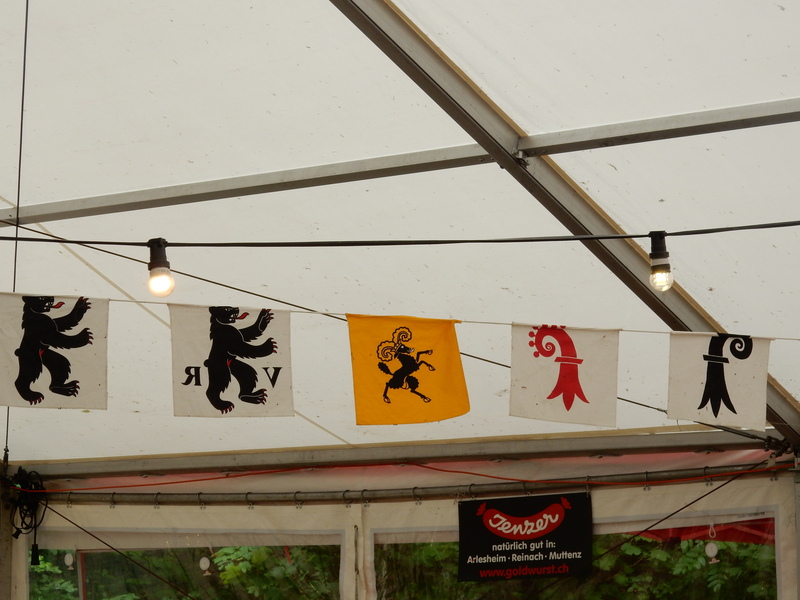 Bunting with the coats of arms of all the cantons had been strung up in the tent. The two to the very right in the photo below are Baselland (in red) and Basel-Stadt (black). The symbol is a Baselstab or Baselerstab – a crosier or pastoral staff. I was sitting on the wrong side of the bunting, so they’re actually facing the wrong way – the Baselland one is supposed to face to the right! Wait.. isn’t this the start again? It was a beautiful day and a nice walk… and also a good opportunity to discover what ground our town actually covers! We left before the real party got started – it’s not much fun when you don’t know anyone, and almost everyone was way older than us – but on the way home I couldn’t resist taking a few more photos of the cows at the farm and the scenery. I still can’t quite believe that this beauty is within 20 minutes walk of my house!